You can Ritual Summon this card with any "Vendread" Ritual Spell. You can banish 1 "Vendread" card from your GY and declare 1 type of card (Monster, Spell, or Trap); for the rest of this turn, your opponent cannot activate cards or effects of that type. 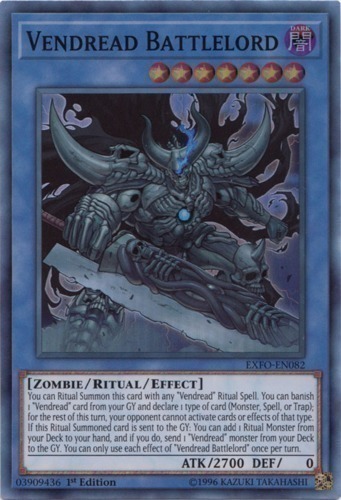 If this Ritual Summoned card is sent to the GY: You can add 1 Ritual Monster from your Deck to your hand, and if you do, send 1 "Vendread" monster from your Deck to the GY. You can only use each effect of "Vendread Battlelord" once per turn.